You can now buy The First Easter Bunny on DVD! WHAT'S IT ALL ABOUT - The First Easter Bunny is a comedic short film about the rise and fall of the original Easter Bunny and his hometown of Fitchburg Massachusetts. Wh-wh-what? 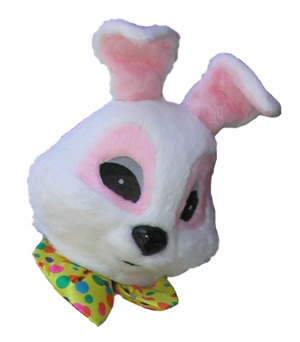 You didn't know the Easter Bunny was from Fitchburg? The city posted signs saying so -- so it must certainly be true. STILL DON'T BELIEVE US? See for yourself in these articles from local newspapers mentioning the mysterious signs, an Easter Bunny sculpture, and the tale of a badly drawn bunny. Priest Pens Children's Tale About "First Easter Bunny"
WHAT'S ON THE SITE - Poke around and hunt down some Easter Eggs to learn more about the movie. Read the Production Diary, check out the Cast & Crew, teach yourself The Easter Bunny Theme, and take a sneak peak into the Bunny's Workshop. STUFF TO BUY - This film can only be seen at AF Grant's house, Film Festivals, or you can buy your own copy. We also offer plenty of other merchandise to support our humble cause. Or, feel free to browse the production stills at shutterfly.com. EVERYTHING ELSE - Play the thrilling First Easter Bunny Puzzle Game. Check out the prophetic fortune received by Producer Brian DelGiudice during The First Easter Bunny production.